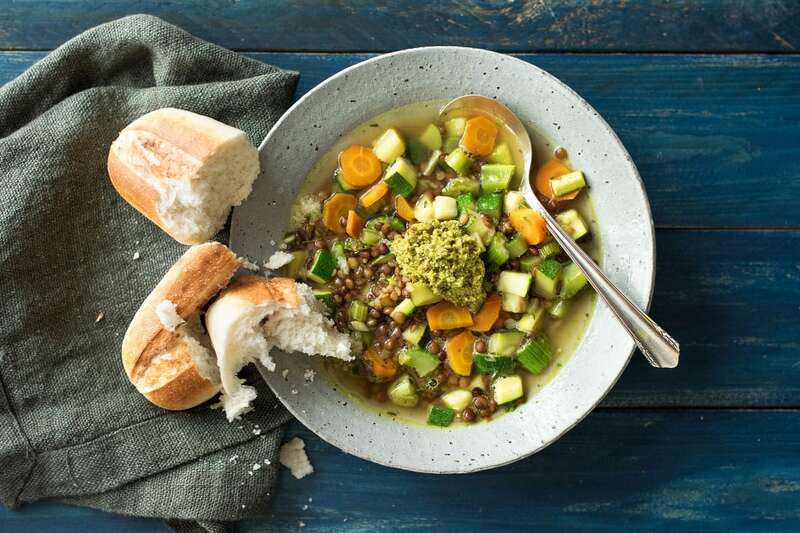 This soup is humble yet hearty, with lentils adding an undeniable richness to this rustic warming supper. Bright traditional pesto enlivens these earthy root vegetables, and of course we’ve given you some crunchy fresh bread to sop everything up with. Bon appetite! Preheat the oven to 200°C/180°C. To prepare the ingredients, finely chop the brown onion, carrot (peeled) and thyme. Dice the celery and zucchini. 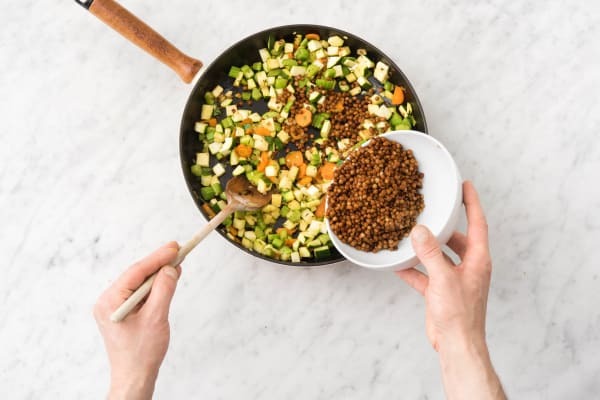 Peel and crush the garlic, rinse and drain the lentils, and crumble the vegetable stock. Heat the olive oil in a large saucepan. 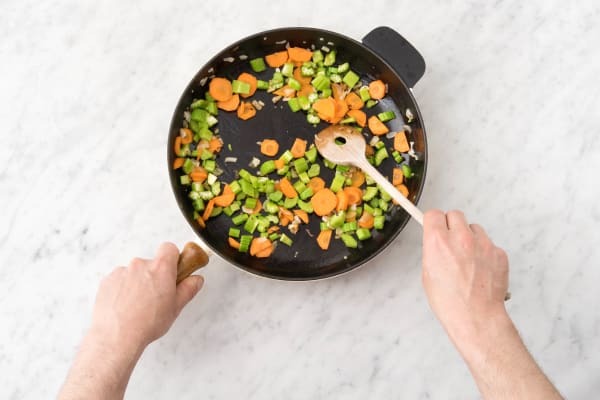 Add the brown onion, celery and carrot and cook for 5 minutes, or until vegetables are soft. Add the zucchini, thyme and garlic and cook, stirring, for 1 minute or until the garlic is fragrant. Add the lentils, crumbled stock cube and hot water and bring to the boil. 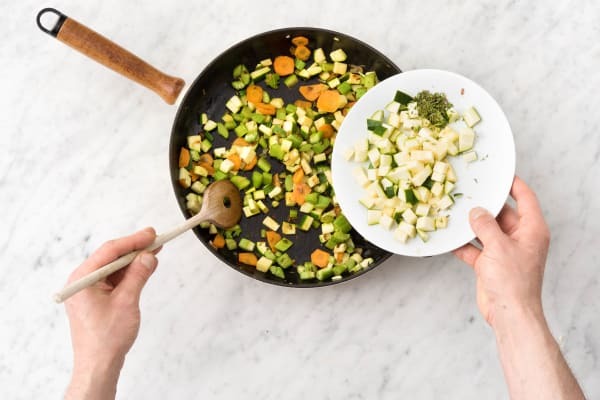 Reduce the heat to low and simmer for 10 minutes or until the vegetables are tender. Meanwhile, place the bake-at-home mini baguette on a baking tray in the oven, and cook for 3-5 minutes. 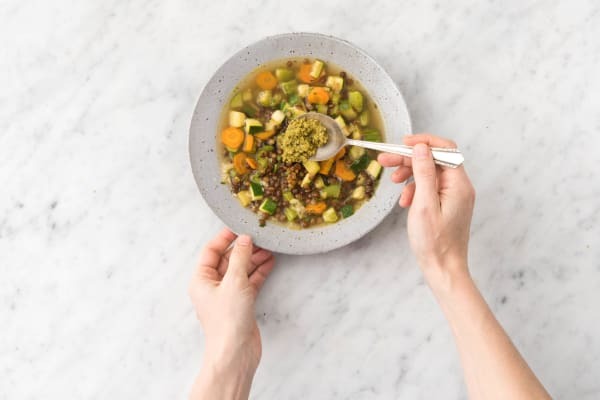 To serve, divide the soup between bowls and dollop with the traditional pesto. Serve with the warm crusty baguette.